The world need know exactly who are: 1. The Israelite (not Jews), 2. The Hebrew (not Jews), 3. The earlier Jews (not Israelite and slightly Hebrew), 4. The latter Jews (not Israelite nor Hebrew), and 5. The Beta Israel (Israelite not Jews); plus 6. The Palestinians (neither Israelite, Jews, nor Arab). The original Israelite: they are the immediate descendants of Jacob “Israel” from his children. They were a Hamitic Arab tribe in Yemen. Appeared around 1930 BC. (Note: All Arabs are Hamitic and NOT Semitic as widely believed, while the Canaanite are Semitic NOT Hamitic, the myth of Hamitic Canaan was invented to justify colonization). The Hebrew: they are the same Hamitic Arab Israelite but became Hebrew after they invaded and colonized Canaan and mixed with Semitic Canaanite starting from 1406 BC. They rejected to stay in the original homeland of the Israelite which was in Yemen and Asir (now in Saudi Arabia). They were the first to claim that Canaan is a holy Promised Land for them. They were also the first to change the teachings of Moses “The Law” and the history of Israelite to justify the invasion and colonization of Canaan. 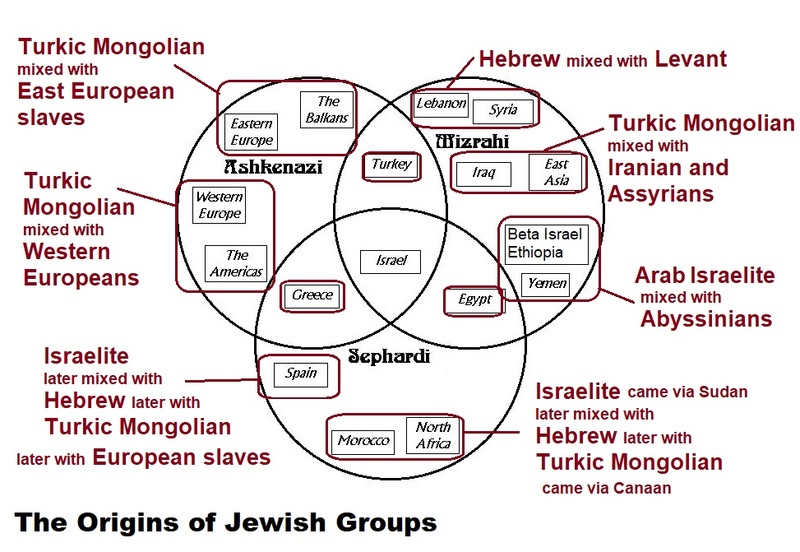 The earlier Jews: They were Asiatic Turkic Mongolians came via Persia (Iran) and Mesopotamia (Iraq) starting from 530 BC. They invaded the Hebrew and colonized Canaan. They expelled ten Hebrew tribes and Canaanite and absorbed two Hebrew tribes and brought the Palestinians in exchange for the expelled groups to serve them. The earlier Jews were the second invaders and colonizers of Canaan following the Hebrew. The latter Jews: They are a mixture of Ashkenazi, Sephardi, Mizrahi, and other groups from different origins mixed with different enslaved people. When the earlier Jews migrated to Europe and various regions they left behind their vassals the Palestinians. The migrating earlier Jews enslaved Eastern and Western Europeans and mixed with them. In 1870 AD this mixed groups created Zionism ideology, with the support of the Ottoman Empire, to call various groups of any links to Israelite, Hebrew, and Turkic peoples to re-conquer Canaan and to struggle to take it back from the Palestinians and establish a modern Jewish State of Israel. Beta Israel Israelite: The Arab Hamitic Israelite fled Yemen to Abyssinia in 1876 BC escaping drought and disturbances. The Israelite took refuge in Abyssinia for 430 years. Some Israelite mixed with Ethiopians and Sudanese and when they were expelled they fled to Yemen in an Exodus in 1446 BC by crossing Bab-el-Mendab “Gate of Grief/Tears” leaving behind a sizable community of Africanized Israelite. The Palestinians (not Jewish): a Mix of non-Arab people brought by the earlier Jews from Crete and other Mediterranean regions after 530 BC to replace the expelled ten Hebrew tribes “the Ten Lost Tribes of Israel” and Canaanite to serve the earlier Jews. It is all so very confusing for most of us. We need to resist the oppression and enslavement of people wherever it occurs.